The deadline to file a candidate statement for a statewide office for the June 3, 2014 Statewide Direct Primary Election is 5:00 p.m. on Wednesday, February 12, 2014. Four Democrat statewide elected officials are helping the California High-Speed Rail Authority to perpetuate its costly and deceptive operations at the expense of the People of California. At various times, the Governor, Treasurer, Controller, and Attorney General had the authority and the responsibility to serve as an appropriate check and balance against a looming boondoggle. Instead, they chose to support the continuation of the debacle or shirked their duties at pivotal moments, even after a court ended all doubts by confirming that the California High-Speed Rail Authority failed to comply with the law. Three of these officials are running for statewide office again in 2014: Governor Jerry Brown and Attorney General Kamala Harris for re-election, and Controller John Chiang for Treasurer. (Chiang and Treasurer Bill Lockyer are termed-out in their current offices.) Right now no Republican has announced an intention to run for Treasurer, Controller, or Attorney General. Why not? Imagine the potential for effective advertising on radio, television, web, and mailers. When one-party dominates the government, checks and balances in our constitutional republic become weak and ineffective. As the most expensive construction project in human history, the High-Speed Rail project will subject future generations of Californians to oppressive public debt as interest is paid on billions of dollars borrowed through bond sales. Where is the accountability to the People? Republicans need to run for all four of these offices to inform and remind citizens how top state elected officials failed to protect their interests. Gov. 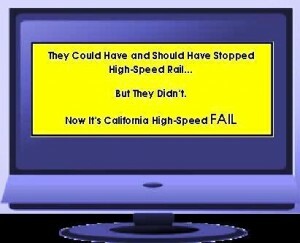 Brown’s undiminished support for California High-Speed Rail appears to be his most glaring vulnerability. Some observers speculate there are psychological reasons for Brown’s persistent support of High-Speed Rail. An opposing candidate would be wise to limit remarks to Brown’s fiscal and management shortcomings: there’s plenty of material for speeches and campaign advertising. Latest in the relentless series of Brown’s poor decisions concerning High-Speed Rail is accepting a $27,200 maximum contribution to his re-election campaign from the winning contractor for the first construction segment. This contribution was received and processed by the Brown campaign as Gov. Brown petitioned the California Supreme Court for extraordinary relief so the state could borrow money for the project by selling bonds. Both Republicans running for Governor – Tim Donnelly and Neel Kashkari – have chosen as a prominent part of their campaigns to criticize California High-Speed Rail. Top Democrat political consultants tweeted retorts against Kashkari when he pushed his “Crazy Train” campaign message on Twitter. When big-shot strategists for the political party with hegemony in California actually condescend to respond to opposition statements, you have identified a weakness in your opponent. In November 2008, 52.7% of California voters (and 78.4% of San Francisco voters) approved Proposition 1A, which authorizes the State of California to borrow $9.95 billion by selling bonds for what was touted as a $45 billion complete California High-Speed Rail system. Including principal and interest, the total cost of Proposition 1A for taxpayers was estimated in 2008 to be in a range of $19.418 billion to $23.195 billion over 30-40 years. Solely for the purpose of authorizing the issuance and sale of the bonds authorized by this chapter and the making of those determinations…the High-Speed Passenger Train Finance Committee is hereby created…The committee consists of the Treasurer, the Director of Finance, the Controller, the Secretary of Business, Transportation and Housing, and the chairperson of the authority…The Treasurer shall serve as chairperson of the committee. On March 18, 2013, this California High-Speed Passenger Train Finance Committee authorized the State of California to borrow $8.6 billion for high-speed rail by issuing bonds. None of the five committee members (including the elected State Treasurer and elected State Controller) attended personally: they all chose (as allowed by law) to designate representatives to act in their place for all purposes as though they were personally present. Both your State Treasurer and State Controller failed to follow the law when their proxies authorized the bond sales for California High-Speed Rail. Republican candidates need to tell the voters of California. On January 24, 2014 California Attorney General Kamala Harris submitted an extraordinary petition to the California Supreme Court on behalf of Gov. Brown, the California High-Speed Rail Authority, the California High-Speed Passenger Train Finance Committee, the California State Treasurer, and other interested parties. It came with 9,538 pages of exhibits. 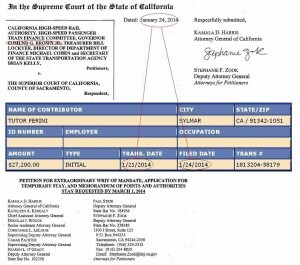 Bypassing the appellate court, this petition asked the Supreme Court to review the Superior Court decision and then allow the bonds for High-Speed Rail to be issued. For the democratic process to work, the courts must fairly interpret laws in a manner that permits government to accomplish their objectives, rather than adopting cramped constructions that frustrate legislative and voter intent. Those “cramped constructions” are actually checks and balances to prevent the California High-Speed Rail Authority from turning a $45 billion high-speed rail system (the original voter intent) into a $68 billion “blended plan” between San Francisco and Los Angeles, with commuter rail incorporated into the plan at each end of the route. The Authority is faced with a Hobson’s choice: it can pursue appeals that may take years to resolve and incur the exorbitant costs, fiscal and otherwise, that will attend the delays, or accept and comply with the orders, likely mooting an appeal, and attempt to move the project forward on the trial court’s and private parties’ terms. But “moving the project forward” would not be on the terms of the trial court or private parties – it would be on the terms of what state law says are the purposes of the bond sales, as approved by voters in Proposition 1A. In fact, the Committee’s conclusion that bond issuance is necessary or desirable is not a substantive determination that requires a particular quantum of evidence. Left undisturbed, this ruling will disrupt the State’s ability to finance the high-speed rail system as well as other projects funded with general obligation bonds. “Quantum of Evidence” is not a movie title, but it is something that citizens might reasonably expect before there is a “quasi-legislative action of an administrative body.” Of course, California elected officials want to avoid a burden on their bond lawyers to defend the necessity or desirability of borrowing money. In fact, the entire municipal finance industry has an interest in avoiding reasonable standards of necessity or desirability for selling bonds. It seems the Attorney General is willing to set aside state law and squelch the power of a court – one of the checks and balances in the constitutional structure of government – for high-speed rail. Perhaps she honestly sees the project as something that transcends the law, an emergency quest to save humanity by “reducing air pollution and the greenhouse gases that are causing global warming.” Or perhaps it’s just politics. Attorney General Kamala Harris is running for re-election. Does she respect the law when it interferes with the government’s process to “accomplish their objectives?” If not, a Republican candidate needs to tell the voters of California. This entry was posted on Monday, February 10th, 2014 at 11:58 pm and is filed under Blog Posts.